Easy snack here people. I’m talking, almost as easy as my white trash candy, except this has less ingredients. I whipped this up in under 15 minutes. It makes a big bowl full, so if you’re trying to be careful with what you eat, you may not want to leave this on the counter. In front of you. Within reach. See, I just kept grabbing a piece, all day long. Before I knew it, I probably consumed half a batch of this treat, on my own! Good thing it is so easy to make, I can whip up a second batch in no time, and no one will be the wiser. However, they may be suspicious when I don’t get off the treadmill this evening! In large bowl, mix together pretzels, Oreos and M&M's. Melt vanilla candy coating according to package directions. Pour melted chocolate over M&M mixture. Pour bunny chow onto a large piece of parchment paper on countertop. Sprinkle with 2 Tbsp spring sprinkles (say that 5 times fast)! Let stand about 10 minutes until hardened. Break into pieces and put in a ziploc bag for storage. Enjoy! So cute!! Looks so very yummy and colorful. 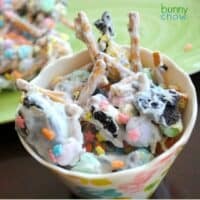 Perfect treat for spring! i have all of these ingredients in my pantry right now! i would have NEVER thought to combine all of it for a sweet and salty snack. LOVE this! Such a great treat for Easter coming up! Loving the salty sweet combo with the pretzels! I would not trust myself around this!! Enjoy the addition of pretzels. Choc covered pretzels are soo good! 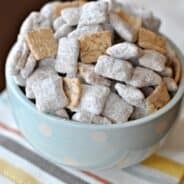 i love puppy chow and white chocolate chow! made some over xmas, so addictive. So cute and springy! Definitely want to try this!! Wow, this probably would be gone in less than a day. And I’d be the only one eating it. So cute and what a great idea. YUM! Yummy! Perfect snack for a class party!! I’m following you from Trick or Treat Tuesday! YUM! Love that there are Oreos in there. Delicious! how cute and yummy – I appreciate your link at Tea Party Tuesday! At first glance (and until I read the ingredients) I thought this had Lucky Charms in it. Will be making this for the kids classes this year. I don’t know what vanilla candy coating is? Can someone explain to a1st timer. Would love to make this for my kids. Thank u!! 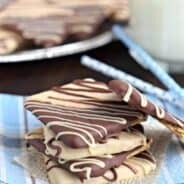 @ anonymous- vanilla candy coating is sometimes called vanilla bark at the grocery store. You find it in the same aisle as the chocolate chips, and it’s sold in vanilla or chocolate flavor. 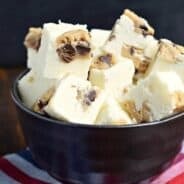 If you can’t find it, you can always use white chocolate, however it takes much longer to set, and it has a tendency to melt easier in the hands. This is so cute! I have a Bunny Tail Bark recipe coming up on my blog that reminds me a bit of this one. This really sounds delicious! I hope you will link up to my Hippity Hop Easter Project Hop. Mmmm…all those yummy festive treats in one adorable bite! This looks super yummy! I am a nut for snack mixes. I pinned this so that I can make sure to give it a try. I am stopping by from Chef in Training. This looks sooo good! And cute 🙂 I’m so trying this! Thanks for sharing 🙂 Cheers!